St. Louis is known for so many things, though the most notable is definitely that he has that city named after him. Totally ignoring the 13thC saint's other accomplishments and bringing DC a taste of said city: District of Pi. Based out of the land with a 314 area code (3.14 is also almost pi, which in turn is almost pie, so there's sort of a lot going on there), Pi is set to serve Penn Quarter award-winning deep dish from a skylit, chandelier-laden pizza haven with a huge, indoor faux-veranda and 40ft of bar. 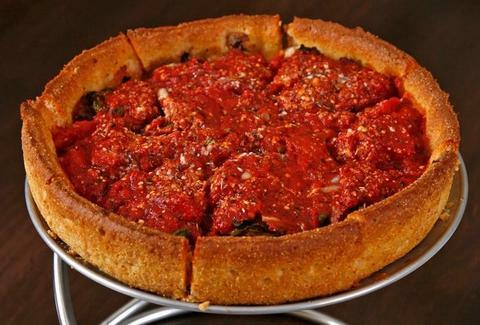 They're known for their deep dish cornmeal crust back home, which cops ingredients like zucchini, fresh tomatoes, and feta in The Lincoln Park, and mozzarella, Italian meatballs, and red peppers in The Kirkwood, presumably named for what Shatner gets every time he hears someone mention deep dish pizza. Because deep dish requires an equally deep well of beers, they've got 24 draughts including the house Pi Common (aka steam beer), a California Common from The Saint Louis Brewery, the Schlafly special release American IPA, and an English strong bitter called "Scarlet Lady", or what Shatner tenderly calls his pizza before getting down to business. And since you're an adult and can eat pizza whenever you'd like, thank you very much, they're hitting Sunday brunch with a "breakfast pi" topped with mozzarella and beaten eggs instead of tomato sauce, firmly cementing their reputation as total St. Lunatics.